Tomorrow is Mother's Day, its my day. Its almost like a second birthday for me! I am so excited. One thing that my son gave me, besides a bigger heart and a love of drool, is stretch marks AND LOTS OF THEM! I had seen advertisements for Bio Oil but had never had the opportunity to test it out. Until now. I am not the kind of person who generally likes to use oil because it is greasy and messy--Not Bio Oil! 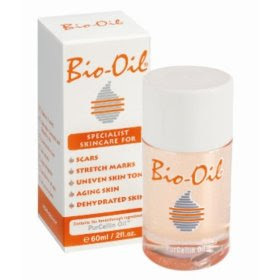 Bio Oil smelled nice, absorbed quickly and wasn't at all greasy. I actually like rubbing it all over my belly!! other skin concerns, including aging skin and dehydrated skin. Doesn't that sound like a miracle? Well, in the short time I have been using it, I haven't noticed these love marks go away, they just have faded slightly! YEAH! That sure is a start. How would you like to win your own bottle of Bio Oil? 3 winners will each receive one 2 ounce bottle!! All you have to do is head over to Bio Oil and find a place, near you, that sells Bio Oil. Come back here and let me know. Include your email address for your entry to count! This contest will run until May 17th at NOON EST! Good Luck. Walgreens, where I shop once a week. Guardian Drug Stores is the closest place to me. I'm a follower on Blogger. :) Thank you! I found your site through someone else's tweet. found you from a friend. They sell Bio oil at walmart here that is the only place I have seen it. I found this contest from someone's tweet on twitter. It is sold at Walgreens which is in my town. I found your site off of another Mom Blog, but can't remember which one but also saw on Prizey.net. They carry it at meijer! I'm a follower on blogger. I originally found your site through Prizey. Walmart, Wallgreens, and CVS here. Oh my gosh! It's available at CVS right down the street! I can find it at Rite Aid near me. Target sells them and luckily there is one near me! Walmart, Zellers, Shoppers Drug Mart and Sobeys all sell them here! I am folling you on Twitter and I tweeted the Giveaway! I found your site on Canadian Contests Worth Entering!